Eliot Spitzer had a deep understanding of the corruption on Wall Street, and he wasn't afraid to take on corrupt fat cats and politicians. Early on he warned that predatory lenders were gauging the little guy, and if left unchallenged, their greed explode our financial system. Spitzer--along with the country's attorneys general--sought permission to do what the Bush administration refused to do: prosecute mortgage industry lawbreakers. They were flatly denied. It's clear that Bush and his cronies just don't care about average Americans. Think about it. The Bush regime not only didn't do their job but they actively worked to bar states from seeking to protect the people. Now, the Bush regime proposes to bailout Wall Street and nothing for the subprime victims. A modified version of that bailout bill was just defeated -- ironically, by the Republicans egged on by the kings of chaos on rightwing radio. These racists blame the Wall Street meltdown on minority victims of subprime predator lenders. Rep. Marcy Kaptur's declares from the floor of the U.S. Congress that domestic enemies of the Republic are the ones pulling the strings in pushing through the unprecedented $700 billion bailout of Wall Street. "My message to the American people don’t let Congress seal this deal. High financial crimes have been committed." "The normal legislative process has been shelved. Only a few insiders are doing the dealing, sounds like insider trading to me. These criminals have so much political power than can shut down the normal legislative process of the highest law making body of this land." "We are Constitutionally sworn to protect and defend this Republic against all enemies foreign and domestic. And my friends there are enemies." "The people pushing this deal are the very ones who are responsible for the implosion on Wall Street. They were fraudulent then and they are fraudulent now." Lots of Americans smell a rat in the rush to bailout of Wall Street -- and concerned folks are raising questions about the rescue plan and who's responsible for the financial mess. Kaptur suggests that she knows who the people are and that they are criminal enemies of the nation. As an elected representative of the people and an official who has promised to protect the nation, it seems to me that Kaptur must let the people know what's really going on. MAD-tv's Sarah Palin takes audience questions. It's funny but my heart is with Fey. Tina Fey as Palin Week 2: Even Funnier! I didn't think SNL could top last week's hilarious Tina Fey-as-Palin inaugural skit, but I was wrong. Last night's sit down with Katie Couric was even funnier -- and, because we're talking about a very serious possibility--a McCain/Palin Regime--even scarier. However, as political comedy it was great. Last week, John McCain sought to bolster Sarah Palin's nonexistent foreign policy credentials by having her sit for photographs with willing heads of state. As expected, Palin scored photo-ops with Afghanistan's Hamid Karzai, Colombia's Alvaro Uribe, Georgia's Mikheil Saakashvili, Ukrainian's Viktor Yushchenko, Pakistan's Asif Ali Zardari, Iraq's Jalal Talabani and India's Manmohan Singh as these leaders gathered in NYC for the annual UN General Assembly. However, it appears some dignitaries shunned the political sideshow, declining the photo prop pleas of McCain-Palin. One such person is the newly elected President of Paraguay - Fernando Lugo. He is said to have confided to friends in NYC that he turned down an invitation to take pictures with Palin. He's a former Roman Catholic bishop, progressive and champion of the poor who broke the 62-year rule of the country's repressive rightwing regime. Very interesting considering the cozy relationship between the U.S. government and the Paraguayan regime defeated by Lugo. BTW: The U.S. established an airbase in strategically located Mariscal Estigarribia in Northern Paraguay -- an area with access to the Guarani Aquifer, the world's largest source of fresh drinking water; close to Bolivia's natural gas reserves, the second largest in Latin America; and within aerial reach of Argentina, Bolivia, Brazil and the rest of the continent. Additionally, Rev. Sun Myung Moon owns (1,482,600 acres), and George W. Bush is rumored to have recently purchased (100,000 acres), land atop the aquifer in Chaco. Q: So, why was Lugo invited to sit with Palin? After all, Lugo is a left of center leader whose family members were persecuted by fascist Paraguayan regimes in league with the U.S. government--and who has not been an ally of the U.S. rightwing. Where in South America is Sun Myung Moon? - Obama more than held his own against a 26 year political veteran. - Obama offered superior judgement in pursuit of national security interests. - Obama was gracious, respectful and likable. - Obama offered proposals that benefit middle Americans - tax cuts, smarter foreign policy, energy diversification, affordable college, etc. - Obama looked and sounded like a commander-in-chief. - Obama displayed a command of domestic and foreign policy. - McCain had surprisingly little to offer Americans on economics. - McCain came off like an stubborn old man on the issue of the Iraq War. - McCain was ungracious, condescending, and dismissive. He never looked at Obama. - McCain became visibly angry when challenged. - McCain repeatedly threw his political ally George W. Bush under the bus. - McCain seemed too desperate, repeatedly pleading for support. My plan also focuses on preserving home ownership; however, I'll do it by aligning mortgage payments with the market value of their properties. Lenders would be mandated to refinance existing mortgages to sub prime borrowers (exclusive of investors) at risk of foreclosure. The refinancing packages would come with a subsidy of between 5% and 30% of principal; long-term, fixed rates; transferability; and default insurance. The result is greater affordability, stability as well as liquidity. I figure such a package costs upwards of $360 billion, or about half of what Bush wants to give to Wall Street. However, the the cost to the public diminishes over time as the housing market stabilizes and homes begin selling at appreciated values. I would add repayment clauses to reclaim all or partial payment on the subsidies for homes selling at appreciated values. Additionally, I would add a transaction surcharge on exotic and large Wall Street transactions, and on executive pay, bonuses and dividends in order to re-coup the public investment. I would also institute tighter oversight and enhanced regulation over the credit markets; outlaw certain Wall Street practices which do nothing but generate huge fees; prosecute Wall Street executives, mortgage brokers, real estate brokers and others involved in deceptive practices and/or shirking their fiduciary responsibilities; and I would only license the selling and packaging of mortgages and mortgage products to insured, bonded and regulated institutions, banks and consumer credit unions. U.S. Representive Marcy Kaptur (D-Ohio) skewers the Bush regime and Wall Street fat cats on their rush to bail out the greedy. In addition, Kaptur proposes a series of reforms focused on securing the finances of the people while prosecuting Wall Street criminals. Her rallying cry - Real Reform Now or Nothing! This may be the funniest video of this improbable yet politically humorous presidential campaign. It's a "movie trailer" about a suburban hockey mom who finds herself President and C.I.C. of the USA. She's plucked from her hockey mom to become VP. The old geezer POTUS croaks -- elevating the mom to commander-in-chief of the world's sole superpower. Looking to take advantage of the novice national leader's inexperience, Russia's Putin makes his move. The president must respond. Relying on her hockey instincts, she challenges the would-be Czar to a face-off. Yes, an actual one-on-one face off on ice in pads, helmet, mouth guard and stick.I think you can figure out how the story ends. Very funny. And scary! When they ask you how long you and "your people" have been in this country, tell them, "Several hundred years." And when they ask you how long you have been an American, even if you arrived in the United States last week, there is only one accurate answer: "All my life." It's true, and the advice sound. Click here to learn why. There's much media buzz re: White voters who will not vote for Barack Obama because of his race. It's hardly news that American racists are, well, racists. Of course, since the story was written and promoted by rightwingers supporting McCain, it's easy to see that the message is really directed to racially motivated white voters in the swing states of Michigan, Pennsylvania, Ohio, Florida, et al, that race voting is OK. It's the same sort of garbage the Clintons and their friends at FOX (led by Hannity, O'Reilly, Rove, Ferraro and Van Susteren) have already been using to gin-up the anti-Obama vote. The truth is that racist voting is despicable, harmful, and immoral (as well as unChristian). 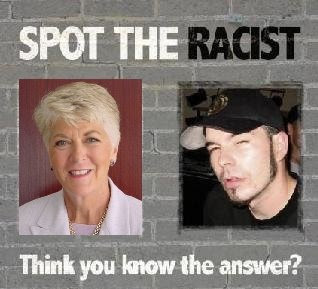 Additionally, blogger Mary MacElveen rightly tags racist voting as a cowardly and unpatriotic. What part of that pledge do you not get? We are one nation, who are supposed to be a united people, who cherish our liberties and most of all justice for all. MacElveen's right -- although that won't stop the racists (overts and coverts alike) from doing their evil deeds. The U.S. government has been turned into an engine that accelerates the wealth upwards into the hands of a few. The Wall Street bailout, the Iraq War, military spending, tax cuts to the rich, and a for-profit health care system are all about the acceleration of wealth upwards. And now, the American people are about to pay the price of the collapse of the $513 trillion Ponzi scheme of derivatives. Yes, that’s half a quadrillion dollars. Our first trillion dollar compression bandage will hardly stem the hemorrhaging of an unsustainable Ponzi scheme built on debt "de-leverages." Does anyone seriously think that our public and private debts of some $45 trillion will be paid? That the administration's growth of the federal debt from $5.6 trillion to $9.8 trillion while borrowing another trillion dollars from Social Security has nothing to do with this? Does anyone not see that when we spend nearly $16,000 for every family of four in our society for the military each year that we are heading over the cliff? This is a debt crisis, not a credit crisis. Just as FDR had to save capitalism after Wall Street excesses, we have to re-invigorate our economy with real - not imaginary - growth. It does not address the never-ending war on the middle class. The same corporate interests that profited from the closing of U.S. factories, the movement of millions of jobs out of America, the off-shoring of profits, the out-sourcing of workers, the crushing of pension funds, the knocking down of wages, the cancellation of health care benefits, the sub-prime lending are now rushing to Washington to get money to protect themselves. The double standard is stunning: their profits are their profits, but their losses are our losses. This bailout will not bring real jobs back to America. It will not bring back jobs that make things. It does not rebuild our schools, streets, neighborhoods, parks or bridges. The major product of this financial economy is now debt. Industrial capitalism has been destroyed. In the next few days I will push for a plan that includes equity for every American in any taxpayer investment in this so-called bail-out plan. Since the bailout will cost each and every American about $2,300, I have proposed the creation of a United States Mutual Trust Fund, which will take control of $700 billion in stock assets, convert those assets to shares, and distribute $2,300 worth of shares to new individual savings accounts in the name of each and every American. 6) Some credible formula for evaluating the price of the assets that the government is buying. 8) Full public disclosure by members of Congress of assets held, with possible conflicts put in blind trust. 11) And, most importantly, some mechanism for direct assistance to homeowners saddled with unreasonable or unmanageable mortgages, as well as protection for renters who have lived up to their obligation but fall victim to financial tragedy when the property they live in undergoes foreclosure. These are just some thoughts on the run. You will hear more from me tomorrow. Here's John McCain in 2002 croaking out Barbara Streisand tunes. The point of the skit is that McCain can't sing and Streisand can't govern, so each should stay out of each other's business. Fact: Barbara can sing. Fact: She's never claimed to know how to run a country. Fact: McCain can't sing. Fact: McCain's retrograde economic and military policies are bankrupting his country financially and morally. Instead, McCain and his understudy, Queen of Alaska, should consider careers as Vaudeville Act on the FOX Dominionist Channel. The cast of the Ultimate Improv perform Les Misbarack -- a fun version of Broadway's Les Miserables. Very funny. Bravo! Tina Fey returned to SNL yesterday to play a dead on Sarah Palin. Fey's enormous comedic talents soar as she captures Palin's flat accent, looks, dominionist certitude and Alaska sized vacuousness. Bravo! The dramatic image "really resonates" with the issue of voting, according to the 27-year-old star. "If you don't register and vote and make a difference, and hopefully change the bad things that are happening in our country, you are essentially just binding and muzzling yourself." A campaign of greed has led to the forced displacement of Arizona's Di'neh-Navajo, the disfigurement of children, exploding rates of cancer, the deaths of thousands, and the theft and despoilment of sacred lands. In simpler terms -- genocide. Senator John McCain and his financial benefactor, the Peabody Energy Corp (Peabody Western Coal Company). To the gentle, matrilineal Di'neh, John McCain is "the Anti-Christ of the Black Mesa". John McCain - The Butcher of Big Mt. A Tragedy- GENOCIDE ! Right here in America!! VANISHING PRAYER - Media Player - Part 1. VANISHING PRAYER - Media Player - Part 2. Need a comedy break? Watch stand-up Nyuorican comedian Bill Santiago's hysterical Comedy Central Special. It's a 20 minute show about being Latino, Spanglish and discovering that you're not weird, it's that you're Puerto Rican. BTW: About half way in Santiago tells why he prefers Latino over Hispanic. It's very funny and so true. Mavericky McCain & Madonna "Vogue"
Madonna and John are no longer friends. They had a falling out after The Material Girl linked his head shot on stage with "Get Stupid". Rude. The one-time Vogue dancer known "Mavericky" gave Madonna a tongue lashing, which she didn't mind. Yes, Mavericky's doll collection, drill everything and kiss the Bush antics got old real fast. But she's moved on--and he's still doing the same (adding dolls, drilling and kissing). She's now with Obama, and she's happy because he's the one we've been waiting for. Oh, but Mavericky sure could Vogue. The selection of perky Sarah Palin for VP electrified the GOP's Dominonist wing, but more incredibly, it revved up John McCain. It's either a miracle, or the little blue pills finally kicked in. Check it out. Funny, funny, funny. James Allen "Jim" Hightower is a populist activist, former Texas Agriculture Commissioner, radio commentator, public speaker, prolific author (including Let's Stop Beating Around the Bush, Swim Against the Current, There's Nothing in the Middle of the Road but Yellow Stripes and Dead Armadillos, Thieves in High Places, and The People Are Revolting! ), and truth-teller. The estimated U.S. Latino population (including the 3.9 million residents of Puerto Rico). of every two people added to the nation’s population between July 1, 2006, and July 1, 2007, was Latino. There were 1.4 million Latinos added to the population during the period. 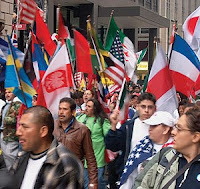 Percentage increase in the Latino population between July 1, 2006, and July 1, 2007, making Latinos the fastest-growing "minority" group. The projected Latino population of the United States on July 1, 2050. According to this projection, Latinos will constitute 30 percent of the nation’s population by that date. The nation’s Latino population during the 1990 Census — less than half the current total. Ranking of the size of the U.S. Latino population worldwide, as of 2007. Only Brazil (184 million) and Mexico (108.7 million) had larger Latino populations than did the United States (45.5 million). The percentage of Latin American-origin people in the United States who are of Mexican background. Another 9 percent are of Puerto Rican background, with 3.4 percent Cuban, 3.1 percent Salvadoran and 2.8 percent Dominican. The remainder are of some other Central American, South American or other Latino origin. About 50 percent of the nation’s Dominicans live in New York City and about half of the nation’s and about half of the nation’s Cubans in Miami-Dade County, Fla. Median age of the Latino population in 2007. This compares with 36.6 years for the population as a whole. Number of Latinos in 2007 per every 100 Latinas. This was in sharp contrast to the overall population, which had 97 males per every 100 females. The percentage of the Latino/Hispanic-origin population that lives in California or Texas. California is home to 13.2 million Latinos, and Texas is home to 8.6 million. The number of states with at least a half-million Latino-Hispanic residents. They are Arizona, California, Colorado, Florida, Georgia, Illinois, Massachusetts, Nevada, New Jersey, New Mexico, New York, North Carolina, Pennsylvania, Texas, Virginia and Washington. The percentage of New Mexico’s population that is Latino/Hispanic, the highest of any state. Latinos/Hispanics also make up more than a quarter of the population in California and Texas, at 36 percent each, Arizona (30 percent) and Nevada (25 percent). 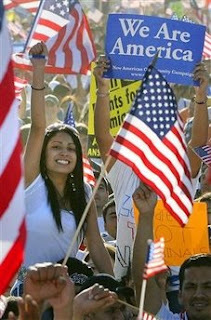 The Latino population of Los Angeles County, Calif., in 2007 — the largest of any county in the nation. Maricopa County, Ariz. (home of Phoenix) had the biggest numerical increase in the Latino population (60,700) since July 2006. Proportion of the population of Starr County, Texas, that was Latino as of 2007, which led the nation. In fact, each of the top 10 counties in this category was in Texas. The increase in Texas’ Latino population between July 1, 2006, and July 1, 2007, which led all states. California (268,000) and Florida (131,000) also recorded large increases. Number of states in which Latinos are the largest "minority" group. These states are Arizona, California, Colorado, Connecticut, Florida, Idaho, Iowa, Kansas, Massachusetts, Nebraska, Nevada, New Hampshire, New Jersey, New Mexico, Oregon, Rhode Island, Texas, Utah, Washington and Wyoming. The number of Latino-owned businesses in 2002. The rate of growth of Latino-owned businesses between 1997 and 2002 (31 percent) compared with the national average (10 percent) for all businesses. Revenue generated byLatino-owned businesses in 2002, up 19 percent from 1997.
. . . of all Latino-owned firms were owned by Mexicans, Mexican-Americans and Chicanos. Number of Latino-owned firms with receipts of $1 million or more. Counties with the highest number of Latino-owned firms were Los Angeles County (188,422); Miami-Dade County (163,187); and Harris County, Texas (61,934). The number of Latino family households in the United States in 2006. Of these households, 62 percent included children younger than 18. The percentage of Latino family households consisting of a married couple. The percentage of Latino family households consisting of a married couple with children younger than 18. Percentage of Latino children living with two married parents. Percentage of total population younger than 5 that was Latino as of July 1, 2007. The number of U.S. residents 5 and older who speak Spanish at home. Spanish speakers constitute 12 percent of U.S. residents. Percentage of Texas residents 5 and older who speak Spanish at home, which leads all states. This compares with the national average of 12 percent. Percentage of Latinos 5 and older who speak Spanish at home. The median income of Latino households in 2007, statistically unchanged from the previous year after adjusting for inflation. The poverty rate among Latinos in 2007, up from 20.6 percent in 2006. The percentage of Latinos who lacked health insurance in 2007, down from 34.1 percent in 2006. The percentage of Latinos 25 and older who had at least a high school education in 2007. The percentage of the Latino population 25 and older with a bachelor’s degree or higher in 2007. The number of Latinos 18 and older who had at least a bachelor’s degree in 2007, up from 1.7 million a decade earlier. Number of Latinos 25 and older with advanced degrees in 2007 (e.g., master’s, professional, doctorate). Percentage of all college students in October 2006 who were Latino. Among elementary and high school students combined, the corresponding proportion was 19 percent. Percentage of Latinos 16 and older who are in the civilian labor force. The percentage of Latinos 16 or older who work in management, professional and related occupations. Number of Latino chief executives. In addition, 46,200 physicians and surgeons; 53,600 postsecondary teachers; 43,000 lawyers; and 5,700 news analysts, reporters and correspondents are Latino. The number of Latino citizens who reported voting in the 2004 presidential election. The number of Latino citizens who reported voting in the 2006 congressional elections. The percentage of Latino citizens voting — about 32 percent — did not change statistically from four years earlier. The number of Latinos veterans of the U.S. armed forces. The San Juan Star, Puerto Rico's Pulitzer Prize-winning English-language newspaper, has closed. Founded in 1959, The Star was the island's sole English-language daily. The newspaper, which once employed Pulitzer Prize-winning author William Kennedy as its managing editor, had 120 employees. The Star had been losing money for years, but the situation worsened with a recession in Puerto Rico and the broader decline in newspaper readership and advertising. The Star was the setting for The Rum Diary, a novel by Hunter S. Thompson. The film version starring Johnny Depp is to be released in 2009. Latino voters favor Barrack Obama over John McCain by a 3-1 margin in the key battleground states of New Mexico, Colorado and Nevada. In Florida, Latino preference is split (and within the MOE) for McCain and Obama. The Latino Decisions poll was completed August 27, 2008 -- the week before the DNC's Denver Convention. Latino Decisions is a joint effort of Pacific Market Research, Dr. Gary Segura, and Dr. Matt Barreto, both of whom are Senior Researchers at Latino Decisions and Professors at Stanford University and the University of Washington, respectively.